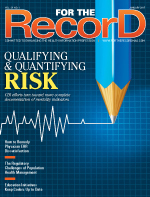 CDI efforts turn toward more complete documentation of mortality indicators. There's a new game in town for clinical documentation improvement (CDI) processes, and it's called risk adjustment. According to industry experts, efforts that have traditionally focused on painting a clear Medicare severity diagnosis-related group (MS-DRG) picture must now evolve to consider a much deeper look at patient conditions to accurately reflect mortality risk. Michelle Wieczorek, RN, RHIT, CPHQ, senior manager of clinical documentation services with DHG Healthcare, says CDI professionals need to pivot their focus. "One of the key things we are trying to reinforce is that it is not enough to simply optimize MS-DRG processes and get to a single complication or comorbidity code," she explains. "It's really coding and diagnosing a patient as deeply and completely as you can." Because risk adjustment related to mortality is intricately tied to reimbursement in today's health care climate, CDI professionals and coders must become astute in recognizing potential pitfalls or run the risk of negatively impacting the bottom line, says James Kennedy, MD, CCS, CCDS, CDIP, president of CDIMD Physician Champions. "There are certain diagnoses that matter and certain ones that don't," he notes. "For instance, shock is underdocumented. Those that matter most are the Medicare methodologies on QualityNet.org and the 3M All Patient Refined (APR)-DRG risk of mortality scores." Wieczorek points out that the major payers use different methodologies to adjust patients into risk pools based on diagnosis profile attributes. "One of the blind spots in the CDI profession is that we are very comfortable—and physicians are comfortable—with the concepts that drive the MS-DRG from a diagnosis perspective. Now we have to take the next step to see what diagnoses impact the risk adjustment," she says. Only about 3% of the hierarchical condition codes and condition codes used for risk adjustment qualify as complications or comorbidities under the MS-DRG system. Therefore, Wieczorek says, CDI programs and coders run the risk of not prioritizing about 50% of the diagnoses when they are placing a patient in a DRG group. The result is a lot of uncovered ground that changes the risk profile and raises the mortality rate. "It can be even the simplest of patients," Wieczorek says. For example, a patient with asthma presents with a heart attack. If the asthma is not documented or picked up by a coder and the patient dies, the risk mortality profile will appear lower than it should. "A very astute coder or CDI professional might note [the asthma] on the medication list. In that scenario, they can have a dramatic impact on the risk profile by simply clarifying with the physician why the patient is taking an inhaled steroid," she says. Shawn MacPhee, MSN, RN, CCDS, a regional CDI director for Anthelio Healthcare Solutions, notes that mortality rates are ultimately impacted by both the quality of care provided and the quality of documentation in the medical record. "The CDI team should help capture the highest severity of illness (SOI) and risk of mortality (ROM) through accurate, complete, and compliant documentation," she says. "If the documentation is inaccurate, then the risk adjustment will be inaccurate." The observed mortality rate is the number of patients who expire in the hospital over a specific period of time, while the expected mortality is the average expected number of deaths within the same time period. The observed vs expected ratio is calculated by dividing the observed mortality rate by the expected mortality rate. To accurately compare hospital performance, the mortality rates are adjusted for patient characteristics that may make death more likely. For instance, factors that influence mortality rates include gender, ethnicity, admit source, admit status, socioeconomic status, present on admission status, procedures, end-of-life decisions/palliative care, and comorbidities such as obesity, malignancy, COPD, diabetes, renal failure, and psychoses. "Rates at or below one are better. Rates above one indicate that more patients died than expected, and rates below one indicate less patients died than expected," MacPhee notes. For example, when a patient with a SOI 4 and ROM 4 is discharged alive, this raises the expected mortality rate and lowers the observed rate, decreasing the hospital's overall mortality index. Kennedy suggests that CDI programs are now responsible for "denominator management," further explaining that these professionals need to understand the differences between risk adjustment cohorts and DRGs. "One of the good things about mortality is that it's easy to measure—you are either dead or you're not," he says. "But they do have inclusion criteria associated with the principal diagnosis assignment. [Many CDI professionals] think the pneumonia cohort is based on DRG, but it's not. It's based on principal diagnosis." For example, a patient can have sepsis due to pneumonia. While it falls under a sepsis DRG, it is also placed into the pneumonia risk adjustment cohort. If the diagnosis is severe sepsis, there are also inclusion criteria that must be included in the pneumonia cohort that can impact the risk adjustment. Kennedy emphasizes that one of the documentation opportunities is then identifying whether the patient has severe sepsis and then sequencing properly. "For cohort selection, principal diagnosis is crucial," he says. "The only the way the coder knows what the principal should be is if the doctor defines it correctly, makes the proper diagnosis, and documents it clearly." MacPhee explains poor documentation practices can negatively impact mortality rates by causing a patient to appear on paper to be too healthy to die. "Providers typically document signs, symptoms, and treatment instead of diagnoses," she points out. "In critically ill patients, symptoms such as fever, hypotension, hypoxia, and altered mental status are typically manifestations of other conditions such as shock, respiratory failure, or sepsis." MacPhee offers the following case example of how skewed mortality rates can impact risk adjustment and, ultimately, reimbursement. A 69-year-old female presents with a past medical history of bilateral hip prosthesis removal for infection and rheumatoid arthritis. Documentation in the medical record includes increased weakness and fever at home. In addition, the abdominal X-ray shows evidence of marked gastric distention. The patient has a temperature of 103.2° F, Spo2 83%, and Cr 1.10. Other documentation reveals that the patient is hypotensive, tachycardic, tachypneic, and responsive only to deep stimuli. Documented treatment in the record includes IV fluid resuscitation, nasogastric tube decompression of the stomach, broad spectrum antibiotics started in the emergency department, patient intubation, and vasopressor support. Diagnoses documented in the medical record are severe sepsis, hypotensive, tachycardic, tachypneic, and the patient became bradycardic. After preliminary coding, the SOI/ROM was 2/1. The clinical documentation specialist (CDS) reviewed the chart and found several opportunities to further specify physician documentation/diagnoses. After reviewing the chart with the provider, additional documentation was added, including linking the organism as cause of sepsis, acute respiratory failure with hypoxia, renal failure due to acute tubular necrosis, and severe sepsis with septic shock. Following the CDI queries and additional documentation, the SOI/ROM was 4/4. CDI programs can more proactively address risk adjustment by leveraging software that calculates the standardized mortality rates. The expected mortality also can be calculated using statistical software or a spreadsheet, MacPhee says. Wieczorek notes that two types of software programs exist: real-time clinical decision support that enables proactive response and solutions that are retrospective in nature. Real-time clinical decision support systems provide research-based algorithm functionality that aggregates clinical data to depict potential mortality rates. Often found in high-end intensive care and trauma units, these solutions may provide clinical pathway guidance based on predicted risk to help intensivists manage patients in real time. Solutions that do not work in real time essentially take all information documented from a clinical diagnosis perspective and attach risk profile attributes to an encounter that has already occurred. In addition to available software applications, Kennedy suggests that coders and CDI specialists become familiar with QualityNet.org—the Centers for Medicare & Medicaid Services' website that explains mortality risk adjustment methodologies. Claims-based measures can be accessed as well as information on inclusion and exclusion criteria and conditions that add additional weight. The website also offers a calculator to help CDI professionals figure out what matters and what doesn't. "When all else fails, read the directions," Kennedy suggests. Armed with solid mortality risk data, Wieczorek recommends CDI programs use concurrent documentation tactics as a best practice for making sure nothing is missed. "Often, the secondary diagnoses are very clinical, and it's hard for coders to read the tea leaves, put together a clinical scenario, and be clinically astute enough to phrase a retrospective query to a provider," she explains, adding that these queries tend to produce better results when initiated verbally by a CDS who has developed a rapport with physicians. As a subspecialty to CDI efforts, mortality review teams are becoming more common in today's health care organizations. Found mostly in large academic medical centers, mortality review teams search for indicators in the APR-DRG, Kennedy says. "Hopefully, they are also determining how they can build the documentation infrastructure to prompt physicians to do the right thing at the point of service," he adds, noting that these teams consider whether care is rendered properly and whether all appropriate comorbidities are captured for coding. "For instance, many physicians will document cause of [death] but they don't know the mechanism of death." "Our CDI team performs mortality reviews to ensure that the documentation accurately reflects SOI and ROM," MacPhee says. After preliminary coding, the coder places accounts on hold for all inpatient mortalities (excluding inpatient hospice) with a SOI/ROM less than 4/4, she says. Then, a CDS examines the medical record for diagnoses that require greater specificity and treatment. "The assessment should also include review of the preliminary coding abstract to ensure that all clinical conditions were captured, including the proper principal diagnosis, all secondary diagnoses, all procedures as well as all pertinent patient history, including social history and family history," MacPhee says. "If the CDS notes documentation in the record that was not coded, he or she will initiate a conversation with the professional coder." If necessary, MacPhee says, a CDS will query a physician. Once the issue is resolved, the system notifies the coder that the account is ready for final coding and billing. Mortality reviews are then reported on a monthly dashboard to CDI and site leadership. Dashboard items will document the number of mortality reviews performed and break those down further to indicate those that impacted SOI, ROM, and both SOI/ROM. • Does the patient look too healthy on paper to have expired? • What is the principal diagnosis? Ensure the coding sequence is correct. • All secondary diagnoses must be documented and coded. • Be aware that multiple comorbid conditions and major comorbid conditions are often necessary to improve SOI/ROM. • Clue in to comorbid conditions that might be hiding in plain sight. These include body mass index, abnormal lab results, cachexia, antibiotic escalation/selection, trauma, cardiac issues, and coma. • Review the record for palliative care (exclusion criteria). Wieczorek emphasizes the importance of completeness. "I don't know a hospital out there that can afford not to look at all their mortalities at the prebill level," she says. When clinical indicators are appropriately documented in the record, health care organizations always consider whether to augment the medical record with diagnoses at the prebill level, Wieczorek says. Kennedy says that when it comes to mortality risk, appearance is critical. Health care organizations want to capture all risk information correctly so the denominator is appropriately high and the numerator is as low as possible. "Do you want to go to a hospital where your chances of surviving are average or better than average?" he asks. "You have to know which indicators matter. Get your definitions down, figure out ways to get doctors to document magic words, and then the coder has to capture them." While completeness is the name of the game, Wieczorek acknowledges that barriers exist even when all the right processes are in place. Progress has been made on the information-sharing front, but interoperability challenges between systems can keep physicians from accessing a full patient picture. "It's getting better because the US government has been driving interoperability to help all these electronic medical systems work together. You can get a continuity of care document from anywhere there is internet access," she says. "But not all organizations have optimal health information exchange. It's still a stretch to say that all have access to a good history that was completed somewhere else."